Black Lightning, season 2 episode 4 recap, "Translucent Freak"
Langston Hughes wrote the above words in 1935, and published them in 1936. In “Book Of Consequences: Chapter Four: Translucent Freak,” some of those words are written on the chalkboard in Jefferson Pierce’s classroom. The words hover above him, as the typically towering, broad-chested man is hunched over at his desk in defeat. It’s the episode’s, and perhaps the season’s, best image. It’s a powerful tableau that tells us everything we need to know about what Jefferson is feeling, and what Freeland is going through. A violent history has made its mark on this town, as it has on America, and the reverberations are still being felt. Hughes’ poem lets its be known that the traditional, optimistic view of America as the land of freedom and opportunity is a narrow one at best, and a violently exclusionary one at worst. That version of America hasn’t and still doesn’t exist for a substantial portion of the population. Freeland is fantastical in the sense that it’s a town populated by metas and villains and a surprising number of substantial drug cartels, but it’s also meant to be a realistic microcosm of a certain American reality. Freeland has its own community, its own set of positive values and good people, but it’s also a town ravaged by a system larger than itself, and one set on upholding a hierarchy that sees the shrewdest, cruellest people installed at the top. "Book Of Consequences: Chapter Four: Translucent Freak"
Freeland is the story of a certain portion of America because it’s the story of different paths taken. There are choices to be made here, and they can determine someone’s fate for life. Khalil is perhaps the most obvious example of that. He went from a promising career in football, and a loving relationship with Jenn, to being nothing but a henchman for Freeland’s reigning crime boss. In that transition, Khalil lost himself, but the show doesn’t pass judgement. Instead, he’s a victim of circumstance, which is something Anissa doesn’t see when she harshly criticizes Jenn for refusing to fully cut him off. Anissa’s reaction comes from a place of protection, as does her vigilantism, but she’s missing one key component: empathy. It’s that characteristic that’s at the heart of the conflict she has with her father throughout this episode. Where Jefferson/Black Lightning insists that the heroes must follow a certain set of rules in order to differentiate themselves from the criminals—a talking point sparked by Anissa’s dangerous bit of stealing from last week—Anissa/Thunder believes that if her intentions are morally sound, then any action deemed slightly immoral or criminal can be considered necessary. It’s a debate playing out in America right now, as news organizations, and the President of the United States, are quick to suggest that all violent acts are equal, that fascist and anti-fascist violence is the very same thing. That kind of thinking not only leads to oppressive, frightening policy decisions, but it also leaves no room for nuance or intellect. Creating a dichotomy rather than a sliding, complex scale is a dangerous business. “Translucent Freak” explores that lack of space in a meaningful, compelling way on numerous fronts. There’s Lynn, who’s struggling to cope with her work and her “partnership” with Dr. Jace. Where Jace only sees bodies made for experimentation, ones that will die no matter what, Lynn sees people with histories, feelings, and a potential life still to be lived. Similarly, Jefferson’s ability to defuse a potentially violent confrontation between two students is the result of his nuanced worldview. He doesn’t see two inherently violent kids, but rather two complicated humans with room to learn and grow. He quotes Coretta Scott King in order to get the boys to see what their interaction means in a larger context, and what hatred can do to them should they allow it to fester. Then, Principal Murphy comes along and unravels all of Jefferson’s good work, instituting his “zero tolerance” policy and expelling one student and suspending the other. Jefferson’s nuanced worldview is lost on this man, who’s given up on these kids because he sees nothing substantial in their future. And this is where Black Lightning slips up. The story of Tobias, the ASA, and the conflict between metas, the government, and the general population is one built on a solid foundation of world building and thematic work. The brewing conflict between Jefferson and Principal Murphy feels far too simplistic. The message is on point, but the delivery is lacking the nuance that Jefferson himself constantly embodies. Murphy is such an outsized villain that he easily slips into caricature, and that robs “Translucent Freak” of some, but not all, of its power. You can read the entirety of “Let American Be America Again” here. “He’s dead.” “And now we have more data.” To say that Lynn and Jace have differing understandings of what they’re doing at the ASA would be an understatement. One really interesting/foreboding development is Jace finding Lynn’s samples of meta DNA, which she of course took from her own family. Jefferson and Lynn keep making these big decisions on behalf of Jenn, and while they’re certainly doing what’s best for her, they’re terrible at explaining their rationale or showing some understanding of her side of things. They’ve pushed her right back to Khalil. 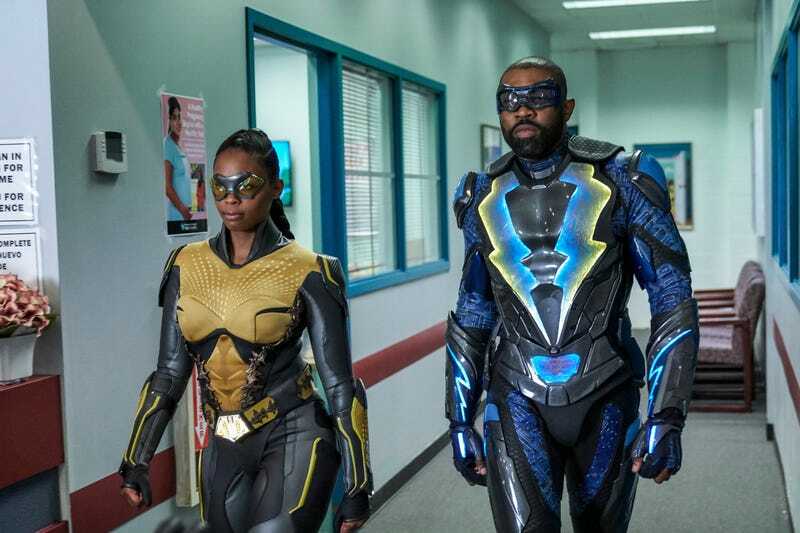 It saddens me to say that this will be the last weekly review of Black Lightning. I might be back to check in some point later this season, and I’ll definitely be back for the finale, but for now that’s it. I’ll definitely miss writing about a show with such fruitful thematic topics and seriously well-developed characters. Thanks for reading.